Sun-Maid Growers is a reputed company that is engaged in sales and production of dried fruits and raisins to innumerable manufacturers of industrial food, various establishments of food service and even to worldwide retail customers. The company is largely reputed to deliver natural raisins without seeds, seedless midgets, raisin pastes, zante currants, moist raisins, jumbo raisins, concentrates of raisin juice, raisin breads, baking raisins, apricots from different regions of California and Mediterranean areas. They even export chocolate yogurt, cranberries, apples, fruit bits, mixed fruits, chopped and pitted dates, fruit-serving snacks, nut mixes and other sausages and culinary products. They were formerly called Californian Associated Raisin Company. They were rechristened in 1916. 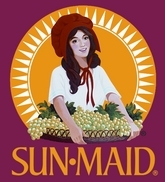 There are currently 0 consumer reviews about Sun-Maid Growers Of California available. Share your review. Please take a note that you are about to post a public review about Sun-Maid Growers Of California corporate office on CorporateOffice.com. This review will be public, so please do not post any of your personal information on this website. If you would like to contact the corporate offices of Sun-Maid Growers Of California, please use their contact information such as their phone number, website, and address listed above to contact them. However, sometimes staff from Sun-Maid Growers Of California headquarters do read the reviews on this website.